Hollow Base points were being made thousands of years ago in the area known today as Egypt. They date back to the beginning of the Neolithic phase in this region when simple agricultural village settlements first appear around 5300 B.C. People living during this period were growing wheat and barley and raising domesticated animals like goats, sheep and cattle. They lived in houses made of mud-daubed reeds or wattling or houses made of mud-brick. 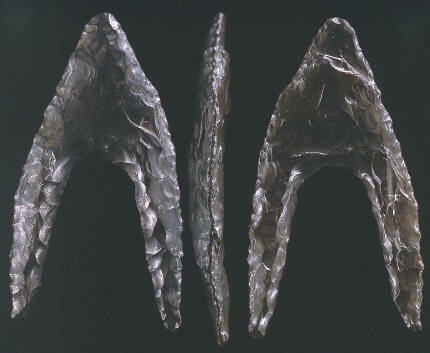 These projectile points were produced up until just before the unification of Egypt, when King "Menes" unites Upper and Lower Egypt with a strong centralized monarchy around 3100 B.C. and a period known as the Old Kingdom begins. This is a very fine example of a Hollow base point. It's made of a dark black opaque chert and measures 1 13/16 inches (4.6 cm) long and 15/16 of an inch (2.4 cm) wide. 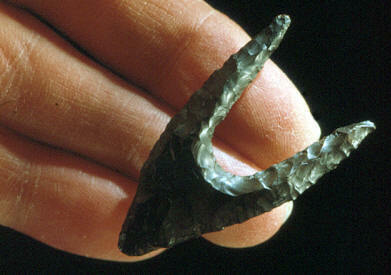 Hollow Base points have deeper concave bases than any other projectile point in the world. One or more of their fragile "ears" are usually found broken off. Complete examples are rare. They may have been designed to break on impact. If that isn't the explanation they might be considered to be a poor design, which is hard to believe since they were made for approximately 2,000 years! The Hollow Base point in this picture is made of a very dark opaque chert of good quality and measures 1 13/16 inches long. The depth of the base is slightly over 1 inch.